If your like me…then snuggles are on the top of your “To Do” list this Winter. Nothing is better than some cocoa and cuddles. So here are some of my favorite things I have bought recently or can’t wait to get!!! Perfect stocking suffers too! 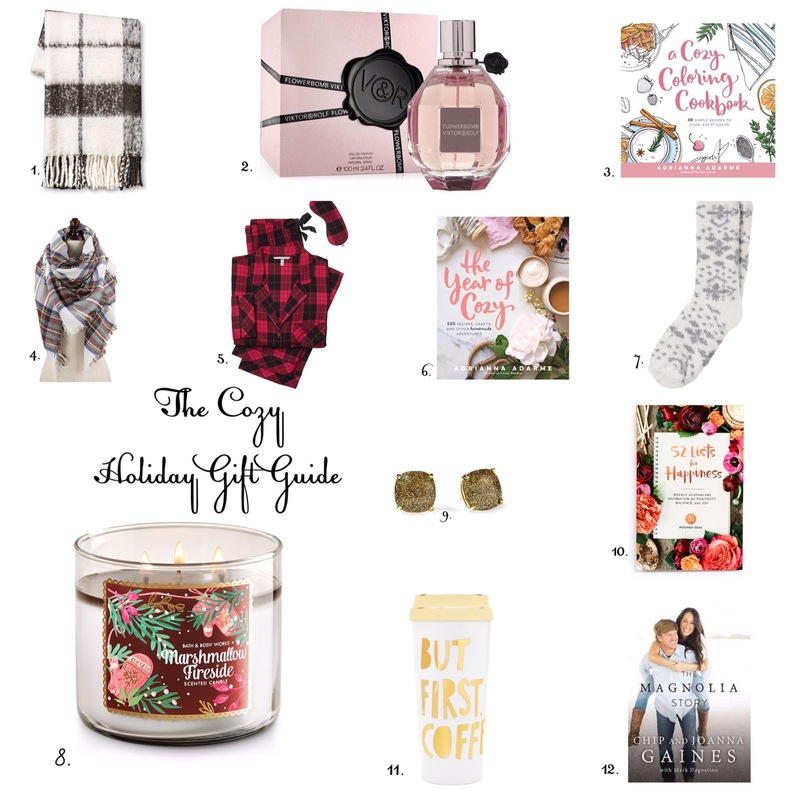 All items are linked to their pictures loves! Target Throws are amazing. The price is perfect and the quality is great. So many choices!!! So you really cant go wrong with gifting nice & neutral blankets in Winter. This is my favorite perfume. I like to spritz a little on after a shower, even on a Saturday where I know I’m just lounging with family. It’s delicate and good for any occasion. Yes please! I love blankets scarfs for many reasons. They can be worn many different ways. They double as home decor. They are also blankets when in need…need I say more? Plus the price makes it a top contender for any giftable event. The Year of Cozy is one of my favorite things to dive into during a long weekend home. It’s 100% relatable. The recipes and crafts are elegant yet doable. Ladies…We all need this book…Great for the Hostess in your life. Cozy socks…literally that’s their name..are you truly comfortable at home without your cozy socks….probably not..It’s winter…suit up! Candles from Bath and Body Works are a current obsession we all love. While they all are amazing..Marshmallow Fireside is my favorite. I keep one in my bedroom and living room. Perfect gift for anyone!! But I must say I stock up on many scents. Can’t go wrong with these. Kate Spade can do no wrong. Especially when it comes to adorable and affordable studs. They come in many sparkley colors and sizes too. Any girl would be over the moon to see these in her stocking! These make me feel gorgeous when I don’t feel like loading up on makeup & jewelry. The 52 Lists Project is one of my favorite past times. It’s weekly journaling to keep you feeling inspired and organized emotionally. So I am so excited to try this new book. I think this is the perfect gift and it keeps on giving. Mugs are usually a staple at Christmas time. But Bando takes it to a new level. All their designs are so lovely. The cups hold up wonderfully as well. I have quite a few of these and their tumblers. But this new gold one is divine! I say it’s the perfect gift. Books are kinda, sorta a major part of life right? And who doesn’t love these two. The Queen of Cozy herself! So get this for any Fixer Upper addict looking for a fix. I can’t wait to get my hands on this!